As production on Shadow of the Tomb Raider draws to a close (we’ll be playing it in two months, folks! ), it’s more than likely that secret pre-production work has already begun on whatever comes next. It’s a pretty gutsy statement for any Tomb Raider fan to put forward, let alone the latest voice of Lara herself. There are places on the internet that would tear you to shreds for even thinking such blasphemy. I’m joking, of course, but there are some pretty strong opposing views to this. Lara is so synonymous with the series that any deviation from her as the protagonist isn’t received very well. With Kurtis Trent, Core revisited one of their earliest proposed ideas for the series right at its conception: that there was to be both a female AND male playable character for the game, and that the player would get to choose who to play. It’s an idea I toyed with myself in the past, suggesting that maybe Lara Croft and Tomb Raider shouldn’t be synonymous. Blood Ties – a vision of the future? “I’d also be interested in seeing Lara as a mother. How would that work? How would she even have time? I’d love to see more action moms in games. There’s so much we can do, so many stories we can tell, it feels like we’re just scratching the surface. God of War recently received mass praise for their soft-reboot of their franchise in which Kratos mentors a young child, so perhaps this idea isn’t something we have to worry about for the future of Tomb Raider. However, in the past this has been more than just an idea discussed between people: back before Underworld was released, it reached the concept-art stage for Tomb Raider as well. Lara was supposed to rescue a young girl called Jessica before she discovered the fate of her mother. One of the overarching themes of recent Raider years has been exploring Lara’s relationship with her family. It was a key point in the original 2001 Tomb Raider movie, then was explored again in the Legend trilogy, again in the reboot, and again in the reboot movie. Many people say it’s been done to death, but it seems some people in the Tomb Raider team are still reveling in that mindset. In the last five games Lara has been following in the footsteps of her parents, and if Camilla’s idea goes further then we can expect to see Lara’s daughter following in her mother’s footsteps. It seems autonomy isn’t a Croft trait that exists in the current incarnation of Tomb Raider. Many people have spoken out against the concept of Lara Croft as a mother, citing reasons ranging from it being too far a stretch from the series’ foundations to it flying in the face of believability, let alone relatability. Now they're just trolling us. They know DAMN WELL this wouldn't fly with Classic Lara – further alienation of Core TR fans. I'm a mum and getting to the supermarket on my own is nigh on impossible, let alone deepest, darkest Peru! For the love of Christ, please NO LARA CROFT AS A MOM game. Ever! Stop forcing in the tired parent narrative into all franchises, especially this one. I also never want to play as Lara's daughter, long-lost 2nd cousin etc. It’s not a wholly unpopular idea, however, with some people being more open to the idea – seeing it as a way to open up gameplay, and even provide a means for co-op gameplay. This could work! Lara Croft could be showing her daughter previous countries and cities of where she used to fight her enemies and collect artifacts from. This is where the levels from previous games could be implemented into ‘the next generation of gaming’. Whatever happens, the next game in the series is likely to be a few years away yet, so don’t expect to see anything anytime soon. However, I wouldn’t be surprised if we see more questionable ideas and talking points in the run-up to – and after – Shadow. Stay tuned! 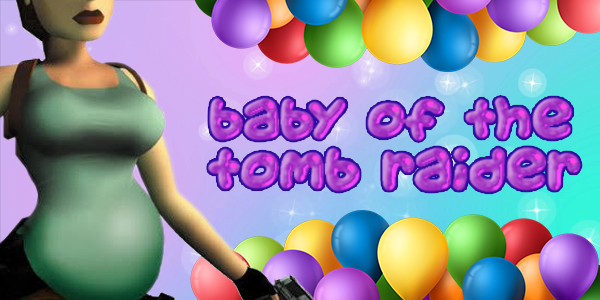 Baby of the Tomb Raider by Chris Carpineti / Survivor Reborn is licensed under a Creative Commons Attribution-NonCommercial-NoDerivatives 4.0 International License. Based on a work at https://survivorreborn.wordpress.com/?p=2611&preview=true. Rescuing someone else’s child maybe, but Lara as a mum? I hope not. There’s been quite enough emotional tug of war with her dad and i wish they’d be done with it and move on raiding more tombs.